The Historic Centre of Sibiu and its Ensemble of Squares is part of the Tentative list of Romania in order to qualify for inclusion in the World Heritage List. Sibiu is promoted as one of the four main tourist destinations in Transylvania– along with Brasov, Sighisoara and Fortified Churches. (I guess the Bran Castle of Dracula fame is something out of the league.) Out of the four, Sighisoara and Fortified Churches are already WHSs, and Sibiu would be the third. But from my view point, compared to the other three, Sibiu does not have a lot to see, meaning even less than Brasov. Of course, that is not to say that Sibiu is less important as a heritage. Indeed, it was the capital of Transylvania during the time of the colonization by Germans / Saxons. The old town of Sibiu does have something somewhat unusual: three inter-connected squares, which is mentioned in the title of this nomination. Still, one of the three is the main square, and the other two do not necessarily look like so-called squares. And some other much smaller squares are scattered around in the lower town, which is the northern part of the old town. I'm not sure if I'd call them "ensemble." I wish Sibiu good luck in getting inscribed. 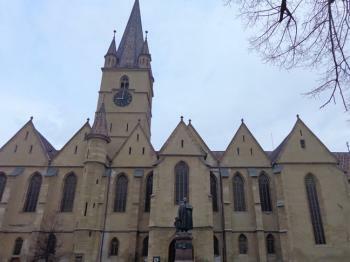 In one of the three squares stands the Cathedral of St. Maria (photo).